Free Article: "10 Tips to Living Well"
I was in Zeeland, Michigan last month, visiting the Herman Miller company. They're the manufacturer of the Aeron chair as well as the Eames chair. Chic for the office, chic for the home. Walking into the building, I felt like a kid in candy store. This is the mecca of design for office workspaces, where form meets function meets elegance meets flexibility meets cool. 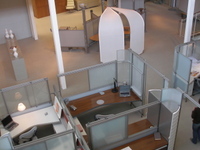 Herman Miller has a number of facilities in Western Michigan. The one that I visited is called the "Greenhouse." The entry (shown to the right) is probably what you would expect in the lobby of a furniture company--samples of their products arranged into seating groups. 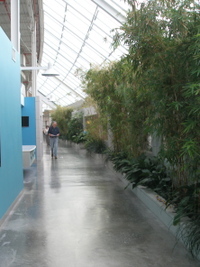 The real meaning of the Greenhouse hit me when I entered a central hallway running the length of the building. Light floods in from above and planters filled with greenery give the feeling of being in a hygienic jungle, without the snakes and spiders. The main hallway is shaped in a slight arc, to take advantage of the movement of the sun throughout the day. And like a real greenhouse, this is a place where stuff grows. There's a vitality in the space, a hum of work being done and the chatter of people inhabiting a place. I've arranged my thoughts from this fascinating day into lessons learned--about work environments, about design, and about the nature of humans. What you can't see in the picture of the hallway: On the right are staff offices. On the left are training and conference rooms and more importantly, entries to the factory floor, where office furniture is assembled. And just around the corner, back near the lobby? A showroom for customers to see the newest products as well as learn how products can be used for different settings (e.g., coffeehouse). 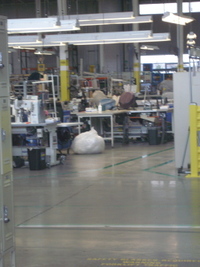 Later in the day, parts of the showroom were being prepped for a product photo shoot. What's the significance of these different functions, literally under one roof? It speaks to the idea of a working environment where the employees are connected to all parts of the business--from customers to manufacturing to R+D to marketing. Sometimes, just steps away from each other. When I was working as an engineer, I rarely came into contact with a customer or saw the end product in use. I didn't have a clear sense of the customer need. I never felt the satisfaction of seeing the result of my efforts in the hands of the consumer. I had no sense of whether my work mattered, whether it brought value to the person paying the bill. Most people already know, intellectually, the benefits of good design. What surprised me is feeling the benefits of good design. I spent most of the day in the facility's main training room, presenting to different groups. It felt good to be in this room--light, simple, easy, interesting. It was like being in a Crate and Barrel store, without the distraction of shopping and having only what you need within sight, no more, no less. Design calls for both form and function and this room was no different. The room was filled with movable chairs and modular tables--configurable in a matter of minutes for the different audiences throughout the day. In the morning, a demo on LEGO SERIOUS PLAY required table space in a rectangular configuration, so that participants could see each other's models and tell stories of what they built. At lunch, I gave a talk on the use of blogs and podcasts for companies. 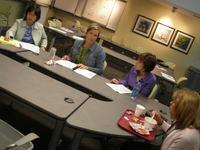 That required a large screen for displaying websites, a laptop hooked in, while participants ate lunch at tables. 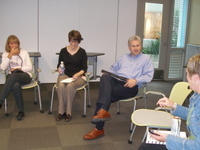 And in the afternoon, we dispensed with tables to make a large circle, coaching managers on their greatest challenges. While most conference rooms in office buildings would have barely managed to be configured once throughout the day, with heavy lifting, this room was re-configured again and again, gracefully and almost effortlessly. I never felt tired in this room, even though there no windows to the outside. It was only at the end of the day that I realized that the building designers had provided for natural light, coming from a raised ceiling. The rest of the lighting in the room provided a warm glow near the walls, highlighting photos of birds in flight, a snowy igloo, and a tree house. Good design makes a difference in how I feel, how well I think, and in turn, how I perform. Lesson #3: Why Shouldn't Work Places Be Fun? The element of fun was integrated throughout the building. 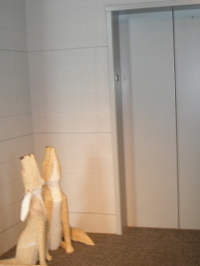 From the two playful chickens that graced the doors to staff offices, to the blue striped booths in the employee dining area, to the statue of coyotes howling next to the elevator. I was amazed at how much it brought me alive to see whimsy and humor in an office building. Foosball tables near the cafeteria reminded everyone that lunchtime was not just for eating. 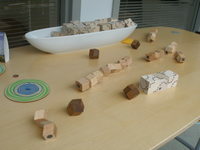 And the adult version of building blocks, laid out on a table outside of a conference room, invited an after meeting discussion that engaged the imagination. Play helps us find new perspectives, create options, and break out of old habits of thinking. 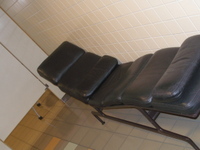 Where else, but at Herman Miller, would you find a leather chaise lounge in the women's restroom? I had to take a photo, just so I could prove it's true. And yes, it's quite comfortable. The cynic in you may be saying that it's easy to provide this type of work environment for employees if you are a world-class office furniture company. But the truth is that someone at the top had to decide that it was worth it, even at cost. My host pointed to the Things That Matter list, printed on a card accompanying each employee's badge. This list includes things that I would expect from a leading edge furniture company, including Performance and Design. What caught my eye was Curiosity and Exploration. I've never seen this on a list of company values. Ever. Not even in work places known for inventions and innovation, like Bell Labs and Apple. It made the coach in me smile. With a little imagination and creativity, these lessons can be applied to many other workplaces. Yes, to do it in a big way, it takes purse strings from the top. But to do it in a small way, it only takes one person to see the benefit and take action. My special thanks to Herman Miller employee and fellow coach, Jodi Oren, for hosting me and opening my eyes to the power of great work spaces. Pledge to Myself: Write, Just Write. maryjane on What Do You Believe?